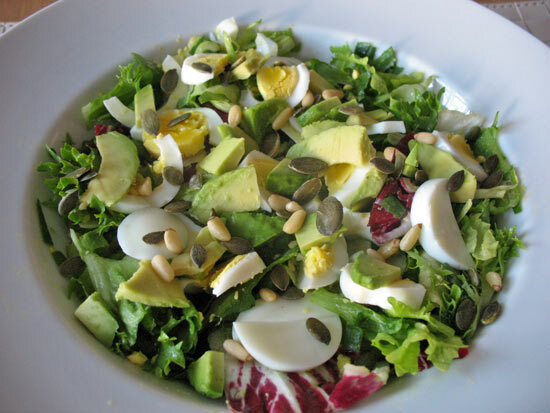 If you somehow missed it, it was National Vegetarian Week from 19th – 25th May and once I saw this challenge mentioned in the Healthy Food Guide magazine I wanted to take part. I thought it would be interesting to do something different, challenge myself and push myself even further when it comes to healthy eating. And I actually did it! I had no meat or fish for a week, but it wasn’t without challenges of course. However, at the end everything worked fine and all my preparations paid off. I wrote a blog post dedicated to preparations for the vegetarian week separately and you can read all of it here. The most important preparation from all was meal planning which would help me go through the week without being stuck and thinking ‘what shall I eat for dinner tonight?’ (although it did happen once! ). I normally eat various vegetarian meals throughout the week anyway, but I needed more ideas for quick and easy meals for those busier days. I turned to Pinterest for this and created Vegetarian board especially for this purpose. Pinterest is really great for recipes and I managed to find some good recipes and ideas on there which suited me. I also looked at websites such as LoveFood, BBC Good Food and others. At the end I gathered a reasonable amount of meals which were quite nutritious and I can easily make. Currently, I continue to expand this resource and over time I hope to have a great collection of vegetarian recipes which I love. After my research was done I wrote my weekly meal plan with ease. This was followed by my weekly shopping and I was ready for the week to begin! Throughout the week I was quite good and stuck to the original meal plan until the weekend came – Saturday, to be more precise. I was then quite open to what to cook – it all came down to what was left in the fridge. By that time my mind was blank and wasn’t sure what to make out of veg I had left, so I asked a question on Twitter. Lovely Camilla helped me straight away suggesting roasted veg and couscous. This sounded good! Simple and easy to make, so I got to work! I roasted veg, made wholewheat couscous, but also added chickpeas to it for that protein boost. I also added finely chopped garlic and parsley. It turned out delicious! I made way too much for one person but my boyfriend enjoyed it the next day for lunch. Here is a full list of all the vegetarian dinners and lunches I had (breakfast was either muesli or fruity porridge). 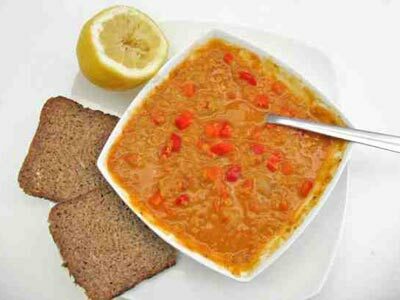 Monday was easy – it was just typical Monday lunch for me: red lentil soup with carrots for lunch which I made the previous day. As I wasn’t too busy after work, I made a dinner which took quite a bit of time: baked potatoes from scratch. Once the jacket potato was ready I ate it with asparagus and poached egg, recipe found on LoveFood website. I never tried this before, but it was quite nice. Poached egg didn’t quite succeed but it was edible (I don’t normally tend to make poached eggs!). 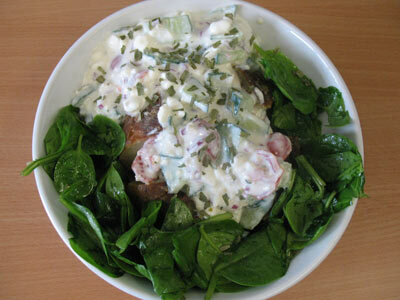 Tuesday lunch consisted of a baked potato I made the night before but I ate it with cottage cheese salad and spinach on the side. I didn’t want to have plain cottage cheese filling and I thought, that by adding some vegetables the meal would be more nutritious and more delicious and it was! 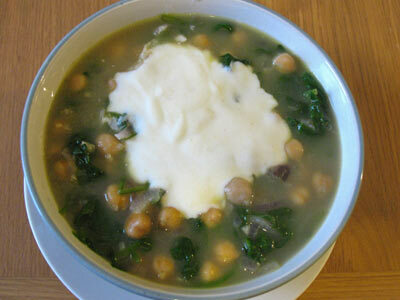 Dinner had to be quick as I went to the gym so I made chickpeas soup with spinach. I made Wednesday lunch before going to work in the morning – one of my favourite salads: Quinoa salad with roasted peppers. Dinner was green lentils with roasted veg and spinach and I made too much of it. At the end I couldn’t eat it all so I had to throw some in the bin. 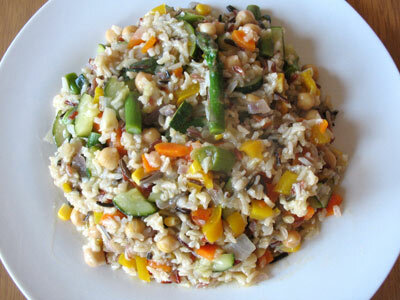 I made Thursday lunch in the morning as well – cold chickpeas salad was quick and easy to make. What took me the longest was actually chopping the vegetables! I never had a cold chickpeas salad before and I am really glad I found this on Pinterest. It turned out to be amazing! I created my own yoghurt sauce to go with it and it was really delicious. I can easily have this for lunch every week now. For dinner I had asparagus omelette which turned out looking funny, as the asparagus I had bought were too thick (they didn’t have anything else), but I also forgot that I should have put them in the egg mix and not towards the end when the eggs were almost cooked. Anyway, lesson for next time! It tasted great however! I also had a side salad made of vegetables I needed to use up. In the evening I also prepared the food for the next day. 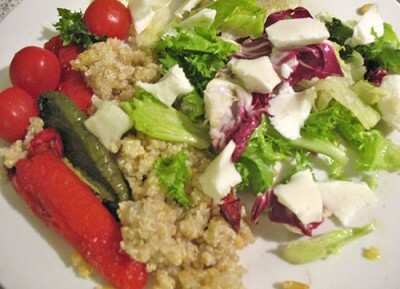 I cooked millet, roasted aubergine, chopped different vegetables and made millet tabbouleh. I made lots of millet tabbouleh which was enough for lunch and dinner. Unfortunately, it didn’t turn out that great. The texture was weird and it had bitter after taste. Although I followed instructions on how to cook millet, the texture still didn’t turn out right. The bitter after taste was because it was possibly rancid, but by washing the millet before and soaking it in water this could have been avoided (I came across one of the blog posts online where they said millet didn’t need washing – so wrong!). I had so much of this weird flavoured tabbouleh with funny texture and I had to eat it for lunch and dinner as I didn’t want to throw it away. I will now think twice before I cook millet next time. But I am determined to make it right – at least once. My next attempt will be a millet porridge and I will see how that turns out. My lunch on Saturday were 2 eggs on toast with avocado, plum tomatoes and low fat mozzarella cheese. Easy and nice. 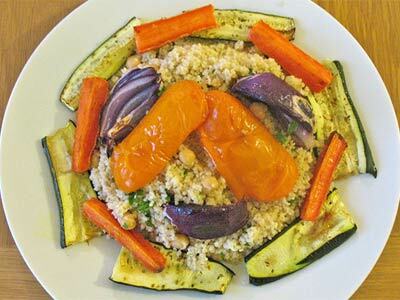 At dinner time I was open to new ideas and Camilla gave me a great idea on Twitter so I made couscous with roasted veg following her suggestion (you can find the recipe here). Last day of the vegetarian week! Lunch was again eggs on toast and for dinner I decided to make a vegetarian brown rice with chickpeas. Me and my boyfriend went to the cinema after dinner and I decided to celebrate my achievement with a scoop of a chocolate ice cream (I just hope it didn’t have any non-vegetarian ingredients, as I didn’t check!). I am really really glad I did this challenge as it opened me to endless possibilities of vegetarian meals. It helped me realise that you could do so much with vegetarian food and it doesn’t have to be in one way all the time. It made me think of the ways I can include different vegetables in a meal. I didn’t miss meat at all, as I don’t eat it anyway apart from the chicken and turkey but it would have been nice to include fish and seafood. In the future, this is what I plan to do: I will eat mostly vegetarian foods with fish or seafood on a table once a week. Have you participated in a National Vegetarian Week at all? Do you eat any vegetarian meals throughout the week? 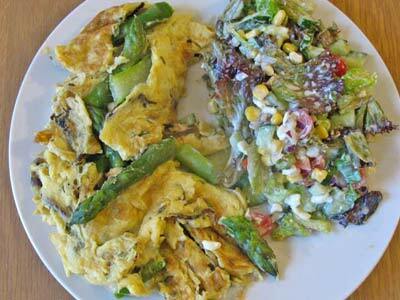 Do you have any good quick and healthy vegetarian recipes you can share?